The Hayward Fault--Is It Due for a Repeat of the Powerful 1868 Earthquake? 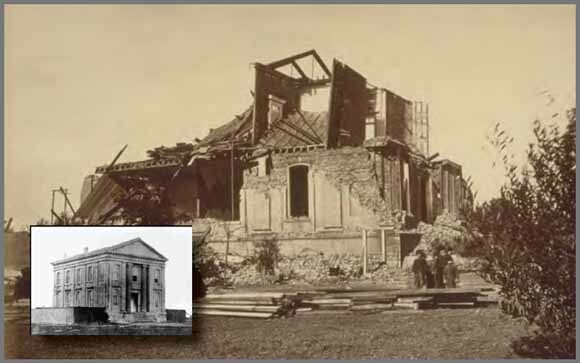 Strong shaking during the 1868 Hayward Fault earthquake caused the second story of the Alameda County Courthouse in San Leandro to collapse and severely damaged the building (photo courtesy of the Bancroft Library, University of California). The inset photo shows the building before the quake (photo courtesy of San Leandro Public Library). The 1868 quake devastated several East Bay towns and caused widespread damage in the San Francisco Bay region. On October 21, 1868, a magnitude 6.8 earthquake struck the San Francisco Bay region. Although the region was then sparsely populated, this quake on the Hayward Fault was one of the most destructive in California’s history. Recent studies show that such powerful Hayward Fault quakes have repeatedly jolted the region in the past. U.S. Geological Survey (USGS) scientists describe this fault as a tectonic time bomb, due anytime for another magnitude 6.8 to 7.0 earthquake. Because such a quake could cause hundreds of deaths, leave thousands homeless, and devastate the region’s economy, the USGS and other organizations are working together with new urgency to help prepare Bay Area communities for this certain future quake. Download this report as a 4-page PDF file (fs2008-3019.pdf; 12.6 MB). For questions about this report, contact Thomas Brocher.